Saturday, April 13, is Record Store Day, a celebration of record albums and the shops that sell them. WUSB-FM will join in the celebration by devoting the day's programming to music that can be found in those magical grooves of plastic. Kicking off at 12:00 a.m. with Kiki & Mike and the Horrorscope crew and running through until midnight, old favorites and obscure gems will be mixed, matched and scratched. 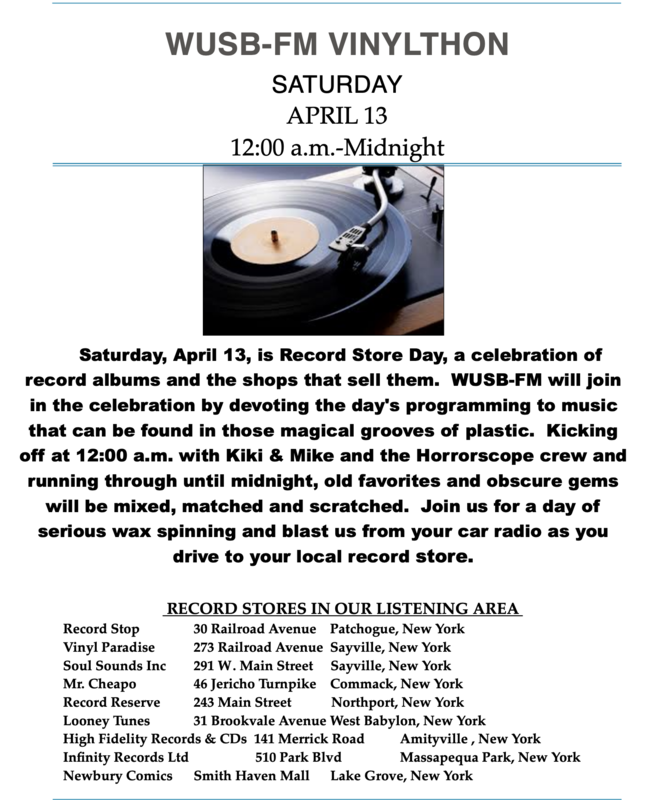 Join us for a day of serious wax spinning and blast us from your car radio as you drive to your local record store. Bill Posley and director Oren Rudavsky are Tom Needham's featured guests this Thursday on WUSB's THE SOUNDS OF FILM. Former SURVIVOR contestant, Bill Posley, will be discussing his new Off-Broadway show, THE DAY I BECAME BLACK. Posley is the creator, writer and star of the show that is playing at the SOHO PLAYHOUSE through May 6th. Director Oren Rudavsky will also be on THE SOUNDS OF FILM talking about JOSEPH PULITZER: VOICE OF THE PEOPLE. This landmark film brings to life a virtually unknown man whose name is attached to Pulitzer Prizes for excellence in journalism. The movie is narrated by Hollywood's Adam Driver and features Live Schreiber as the voice of Joseph Pulitzer. The movie mixes contemporary scenes, beautiful archival images, recreations and interviews in order to tell Pulitzer's story of an immigrant from Hungary who ended up being one of America's pre-eminent publishers in New York. JOSEPH PULITZER: VOICE OF THE PEOPLE debuts on PBS on AMERICAN MASTERS on April 12, 2019. Airs Thursday, April 11 6-8 PM. Legendary musician Robert Berry joins Captain Phil's Planet on April 11th in the 3:00 pm hour to discuss his career, the new 3.2 album, “The Rules Have Changed,” Keith Emerson and the upcoming 3.2 tour! Then at 4:30 Andrew Aydin (www.andrewaydin.com/), Congressional Aide, New York Times Best Selling Author, Co-Author of 'MARCH' with Rep. John Lewis and illustrated by Nate Powell will be calling in to discuss his Captain America Story in Marvel Presents #3 titled Captain America's War at Home! War at home features line artist Daniel Acuna and sets the Captain in 1964 during the civil rights movement. Andrew will be discussing this project as well as the Graphic Novels March and Run which he co-wrote in collaboration with Representative John Lewis. Airs Thursday, April 11, 3-5 PM. Airs Thursday, April 4, 6-8 PM. Sunday, April 14th, 5 P.M. 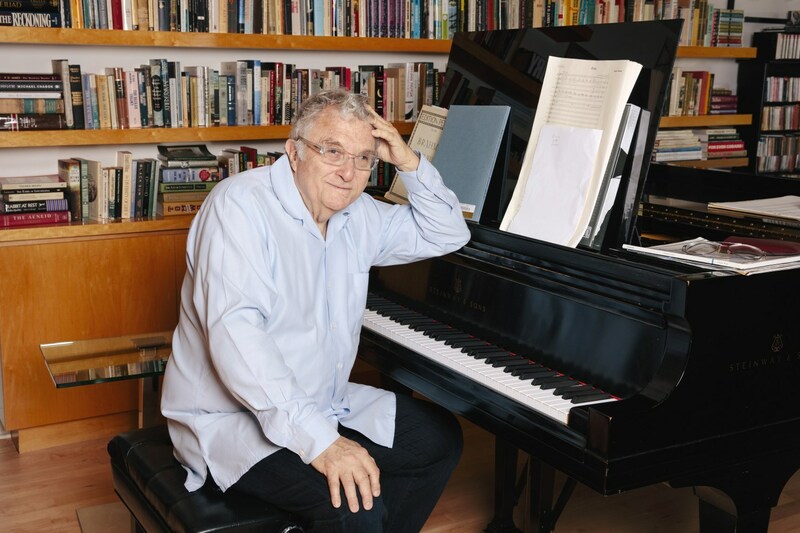 Ever since his 1968 debut album, Randy Newman has been a major figure in American popular music, with eleven studio albums to his credit, twenty-seven film scores, and countless songs. Newman has been a professional songwriter since he was seventeen. Newman’s 75th birthday last November inspired the Sunday Street Series to offer this celebration of his songs. You can expect to hear many Newman classics like “Louisiana,” “I Think It’s Going To Rain Today,” “Mama Told Me Not To Come,” “Political Science,” “Baltimore,” and “You’ve Got A Friend In Me” although some lesser known Newman songs are likely to appear. Miles To Dayton (m2d) blends elements of folk, rock, classical and funk with four-part harmony, clever songwriting, improvisational violin and cello, and an infectious rhythm section, all evidenced in their four studio albums.